Without options to excel outside of the household, many girls are kept silent and their needs are left unaddressed. Unfortunately, gender and age make refugee girls vulnerable to unique and especially dangerous challenges. Some are forced into child marriage in an effort to escape starvation for themselves or their families, often with older men. Every morning Nyakor wakes up before sunrise, prepares her family's only meal for the day -- porridge made of seeds gathered from a nearby tree -- and watches as children leave for school. Nyakor spends the rest of her day cleaning their living area, preparing meals and maintaining the household to the best of her ability. She eats the least and last, and is the first to clean up to prepare for the next day. 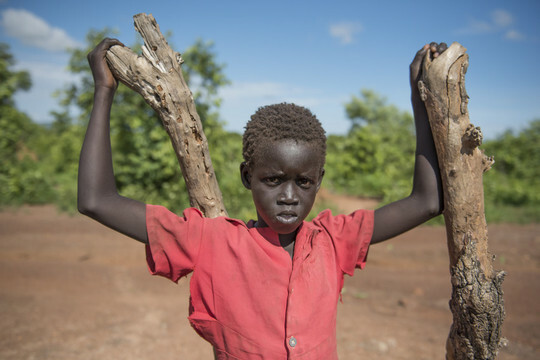 Nyakor is a 10-year-old girl living in a camp for internally displaced persons (IDPs) in South Sudan. For many girls like Nyakor fleeing conflict, famine, or both, everyday life is a complex and harsh reality. When resources are stretched thin, as in times of displacement and famine, gender inequalities become even more pronounced, and girls bear the greatest burden. Their stressors multiply tenfold as they struggle to survive, while also maintaining some kind of normalcy for their entire household. As a young child, that's quite the burden to bear. This daily routine is already daunting for a 10-year-old, but girls like Nyakor also live in constant fear of the gender-based physical and sexual violence often experienced by adolescent girls in refugee camps. But despite their additional hardships and fears, adolescent girls are often overlooked when we think of refugee crises. In many communities like Nyakor's, it is believed that boys are the future. Boys are encouraged to eat more to fuel their physical activity and provide them with energy to do well in school. Conversely, girls are generally assumed to be a burden, and are given less food and no access to education. Without options to excel outside of the household, many girls are kept silent and their needs are left unaddressed. Confinement to their homes also means they have restricted access to critical information and resources. Unfortunately, gender and age make refugee girls vulnerable to unique and especially dangerous challenges. Some are forced into child marriage in an effort to escape starvation for themselves or their families, often with older men. Close quarters in refugee camps mean that girls are subject to increased harassment and violence, often without recourse or any mechanism to punish perpetrators. To make matters worse, there is currently a hunger crisis affecting more than 20 million people -- many of them already refugees or displaced internally in parts of Africa due to ongoing drought. This emergency is inflated by ongoing political turmoil and conflict in several regions, which has created the largest ever number of refugees on the African continent. The resilience of such African communities who live through cycles of drought, or survive despite harsh conflict conditions, has been pushed to its breaking point. Plan International is focused on ensuring those most at risk, like malnourished children under five, vulnerable young girls, and pregnant women, secure the emergency resources they need. We help distribute nutritious food and protect the well-being of children, particularly adolescent girls, who are most vulnerable during crises. Plan International is on the ground responding to this crisis in South Sudan, Kenya, Ethiopia, Nigeria, Cameroon, Uganda and Niger to provide urgent food supplies and lifesaving humanitarian support to children and families. In South Sudan, we've already reached more than 20,000 people through food distribution. In Nigeria, more than 7,000 children have been involved in activities at a child-friendly space that help them to thrive despite difficult circumstances. In Kenya, Plan is helping to keep kids in school by implementing school feeding programs. But current aid funding can't keep up with the pace of need, and support is needed now more than ever. In partnership with the Humanitarian Coalition, Plan International Canada urges all Canadians to help Stop Famine Together. Until June 30th, donations will be matched by the Government of Canada's Famine Relief Fund. On World Refugee Day, let's take a moment and make sure we stay informed about the plight of refugees around the globe. 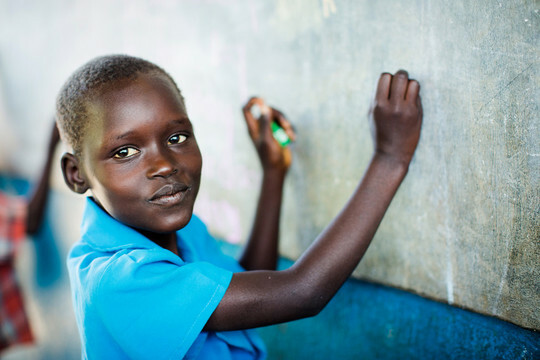 Let's mark the day by not only thinking about Nyakor and the millions of other girls in similarly dire situations, but making sure their stories are heard. Take time to learn more about the intricate complexities of surviving as a girl refugee in the face of famine. Then find a way to act, whether it's by sharing stories online or showing your support through a donation. Let's use World Refugee Day as a vital reminder of the significant issues we face as a global community, and the brighter future for all that we must continue to strive for every day of the year. Dr. Tanjina Mirza is the Chief Programs Officer for Plan International Canada.